Whenever I make up a recipe, I write it on a loose piece of card stock with a Pilot G-2 0.38 fine point gel pen. I can’t do it any other way. No other pens or writing utensils or any other kind of paper. I’m weird like that. The problem with this recipe recording system is that I lose the papers. Paper processing is one of my biggest adulting struggles. So much paper! From everywhere. I can’t even deal. I intentionally use card stock instead of regular paper. The thickness does make it easier to find, harder to lose. But still, I fail. First, the handwritten recipe goes on the kitchen island where all the other papers are, in not so neat piles, along with our nanny binder and kid trinkets. I usually put the recipe on the top of the main paper pile with the plan that I’m going to put it on the blog… later. I think later means, like, oh, tomorrow. But tomorrow never comes. The recipe gets buried in the pile underneath outdated PTA fliers, spelling word lists, an Emerson article I wanted to read (the WEH told me I’d never read it and to “just throw it out”), and Costco receipts. Because I like for people to think that I live with very clear counter tops, before someone comes over, I hide the paper pile(s) in the top drawer of the white Ikea dresser in our living room. This is where all the other un-dealt with paper piles have gone. Along with plastic Easter eggs that never made their way to a holiday storage bin in the garage. I also have a lot of paper piles on the door-turned-desk in my home office. If you can imagine the length of a door, that is how big the desk is. There’s barely enough space on it for my laptop. Some of my handwritten recipes have also gotten into the mix of papers on this large desk. I did buy a binder to stick all my recipes in, after I scrawl them down on the card stock. But then I will still put it on the kitchen counter, thinking I will “get it on the blog”, and then never do. When I look for one of my recipes, there are a lot of places to look. Is it in the recipe binder I tried to organize? The kitchen counter? The top drawer of the Ikea dresser? Buried in the piles on the door-turned-desk in my office? Or is it somewhere in a paper pile at work because I brought it with me to my clinic, in hopes of actually getting it on the blog in between patients? Fortunately, I never lost this muffin recipe! It’s a new one I created this fall and I felt determined to keep my eyeballs on it. I’ve kept it on the top of the pile on my kitchen counter or carried it with me in my lunch bag to work. I know, the lunch bag is a weird thing, but it worked. If it goes in my lunch bag, it’s the only paper in there. You know what that means? IT DOESN’T GET LOST. Genius. And guess what. It worked. I never lost it! I’m totally patting myself on the back for getting a grain-free muffin to work without eggs, dairy, tapioca, or almond flour. IT’S THE YELLOW PEA FLOUR. It’s really changed my baking life. I’m kind of obsessed with it, although it does need to be soaked or my belly doesn’t like it. I haven’t seen yellow pea flour available for purchase anywhere, so I make my own in the dry container of my Vitamix. My eight year old daughter is not as impressed — she thinks they are a little dry. Nothing a little microwave nuke and a pat of butter can’t fix. To be honest, I’m nervous to tweak the recipe. They work perfectly as is, and perhaps they could use a tiny bit more moisture, but we are working with so many restrictions… gluten-free, grain-free, sugar-free, dairy-free, egg-free, vegan, tapioca-free, tree-nut free, soy-free. This is like the ultimate everything-free muffin. I may try to add an extra one Tablespoon of extra virgin olive oil next time. Interestingly, the same eight year old daughter was fighting my six year old over the last pumpkin chocolate chip muffin the other morning. It ended up flying across the kitchen when the Wendy’s Eating Husband tried to pry it out of six year old fingers, landing in a box of recently delivered supplements. That says something, right? These muffins are stevia-sweetened, except for the sugar in the Sunspire dark chocolate chips. Stevia is a natural sweetener that brings zero carbs to a recipe, so it is the best natural sweetener to use. Generally, the lower the carb content, the healthier it is (as long as it is not artificially sweetened — no splenda, no aspartame). Sunspire’s 65% dark chocolate chips are one of the lowest sugar containing chocolate chips on the market… before you get to the erythritol sweetened ones (I’m not a fan of sugar alcohols). 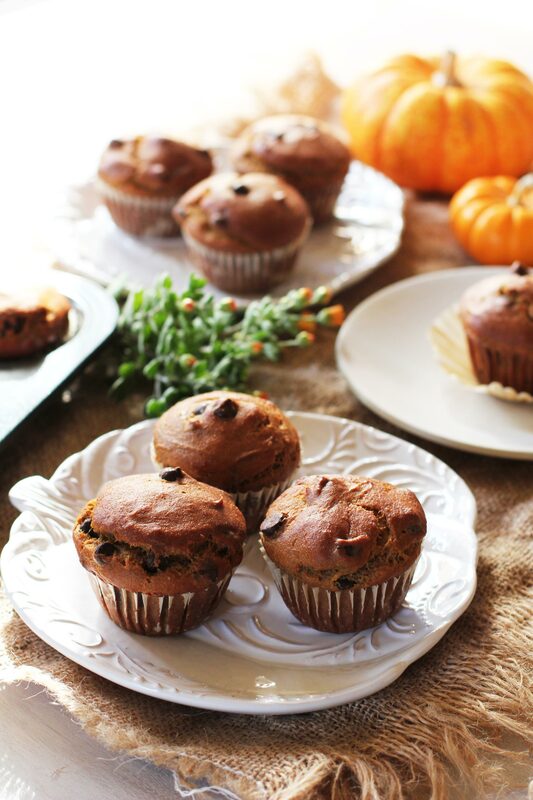 If you want to keep the muffins purely sugar-free, you can make them without the chocolate chips. 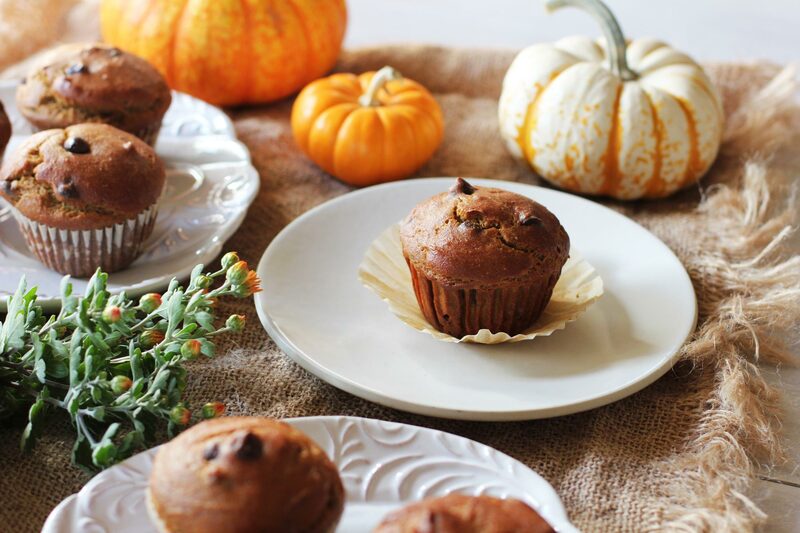 I hope you enjoy these higher protein, grain-free, vegan muffins! I wish I could roll into Starbucks and ask for a blood sugar friendly muffin such as this. Or anywhere for that matter. 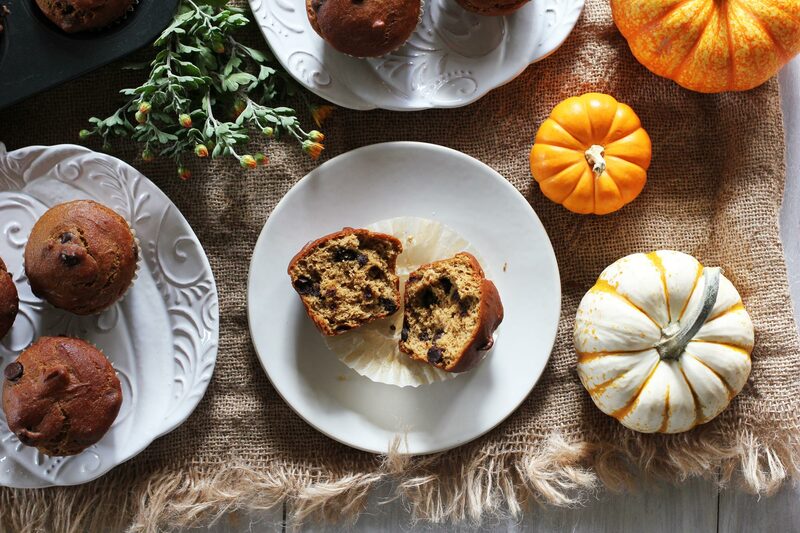 Make sure you have parchment paper muffin liners. In a bowl, thoroughly mix the 2 cups yellow pea flour with 1 cup water and 2 Tablespoons apple cider vinegar. Let it soak for 24 hours. You can stick it in the fridge during this time or leave it on the counter. I have done both. I usually leave it sit out uncovered for about 12 hours and then the rest of the time I place it in the fridge, covered. Thoroughly mix the ground flax seeds, coconut flour, pumpkin pie spice, baking soda, salt, and stevia. In a Vitamix, place the wet yellow pea mixture (that was soaked for at least 24 hours), the olive oil, butternut squash (or pumpkin), and vanilla. Blend well. Carefully pour the wet ingredients from the Vitamix in the dry flour mixture. Stir together. Add chocolate chips, evenly distribute. Divide batter evenly among 12 muffins. Bake at 375° for 30 to 32 minutes or until done. A toothpick inserted should come out clean. I make my own yellow pea flour from dried yellow split peas. I grind them in the dry container of my Vitamix and then sift the freshly ground flour through my stainless steel fine mesh strainer to remove any remaining bits. I prefer using butternut squash in all of my pumpkin recipes. 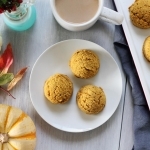 I have tried this recipe with both butternut squash and pumpkin. Butternut squash wins!